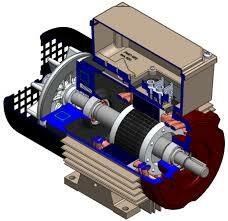 The rotor rotates a rotational frequency n slightly less than ns. A relationship connects these two parts slip g = (ns-n) / n = ns ns --- (1 - g). describes in W the rotational speed of the rotor, it is expressed in rad / s.
The smallest voltage listed on the motor nameplate must be found across a winding. Next the three-phase network used, the coupling will be star or triangle.